It’s here: the most anticipated smartphone of the year. However, we’ve also seen new Android upstarts – the HTC One and Sony Xperia Z. 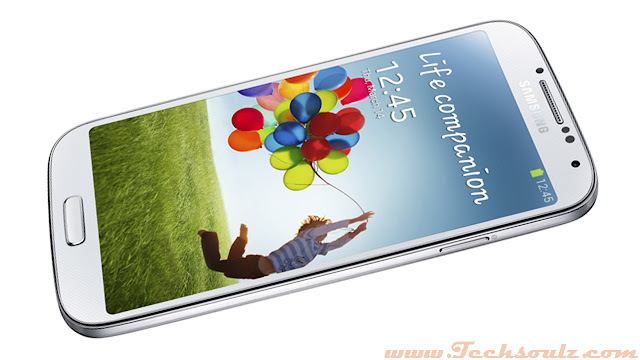 The design, for a start, is a very gentle upgrade to last year’s Galaxy S3. If you felt the S3 looked too plasticky, you’re unlikely to be impressed, but with straighter lines and a subtle texturing effect beneath the glossy plastic, it’s not a bad looking phone. It’s the same height and 0.7mm thinner than the S3. Despite that, there’s a bigger screen – it’s five inches instead of last year’s 4.8 inches – and it now boasts a full-HD resolution. The Super AMOLED screen delivers rich, vivid, bright colours – those colours don’t look as over-saturated as they can on some other Samsung screens, either. In fact, this is one of the best phone screens yet. The HTC One’s screen is marginally sharper, but that’s because it’s packing the same number of pixels into a smaller space. Many smartphones, especially high-end ones, prefer sealed battery units – you can squeeze in more power when you’re not wasting space on the cases removable batteries need – but not the Galaxy S4. It’s stuck with a removable back, meaning the phone creaks when flexed. You can swap batteries for extended use, but who does that? Another benefit to the removable back is the S Cover, which wraps the phone and closes over the screen with a magnet. But it’s the new, innovative features that really make this phone stand out, though. Last year’s Smart Stay technology, where the front-facing camera monitored your eyeballs and dimmed the screen when you weren’t looking directly at it, has been enhanced. Now, if you’re watching video and your focus strays, Smart Pause stops playback until you look back again, at which point it smoothly restarts. It works splendidly and the same principle is used, in conjunction with the accelerometer, to control scrolling on web pages – when you reach the bottom of the page, tilting your head prompts the phone to scroll back up for you. This is called Smart Scroll and it is more gimmicky and jittery than Smart Pause. It’s all part of a new wave of features that mean you don’t have to touch the touchscreen. Pass your hand near the phone when it’s in standby and the screen gently wakes, shows a speckled background with motes floating through light, and calculates how many texts, emails or missed calls you have before turning off again. Similarly, if you hover your fingers near an address book contact, more details are revealed, although only in Samsung’s Email app, not the Gmail one. It’s handier than opening individual mails and gives you a six or seven-line preview of communications. You can also turn pages by waving your hand over the screen. If you use your phone when cooking or just have an extreme aversion to screen smears, it’s a nice (non) touch. Like some Nokia Lumias, you can also use the S4 with gloves on. With your hands now free, Samsung wants you to get active. To this end, a built-in pedometer tracks your steps, sending a notification reward when you reach a set goal. It knows whether you’re walking, running or climbing stairs and there are temperature and humidity sensors. It’s all part of S Health. There’s also S Voice – Samsung’s slower sister to Siri – and S Translator where you speak a phrase at the phone to hear it parroted back in another language. A good data connection is needed for this and clear diction helps, too. The S4’s 13-meg camera delivers strong shots and is easy to use, although it has familiar struggles shooting in low light – of its smartphone rivals, only the HTC One, with its “fewer-but-better pixels” strategy, really thrives in low light. Again, there are features galore, including the ability to shoot with the front and rear cameras simultaneously, squeezing a tiny headshot into your panoramic vistas. You can also add a short audio clip to photos, or cluster a burst of action shots in one picture. The Exynos octacore chip manfully handles anything you throw at it, never slowing down or hesitating, no matter how many programs you have running at once. It’s efficient, too. The battery keeps going for the whole day with ease. As with all heavily used smartphones, though, a nightly recharge is essential. The Android Jelly Bean OS again helps with smooth running. Connectivity is up there with the best, including NFC and an IR sensor, which means you can use the S4 as a universal telly remote. So, is this the best Android smartphone yet? Its combination of power and innovation certainly puts it amongst the Android elite, but for our money it falls just short of the HTC One, while its camera is bested by the Sony Xperia Z, which also boasts waterproofing. The Samsung Galaxy’s star has faded slightly, but there’s still no denying its wow factor. A big, powerful smartphone that’s not afraid to innovate, it’s a five-star wonder.